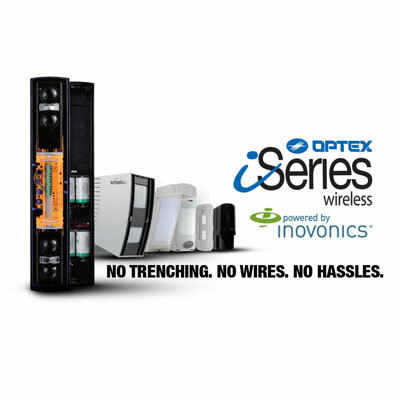 LOUISVILLE, Colo., October 10, 2017 – OPTEX, a global leader in indoor and outdoor security sensors, and Inovonics, an industry leader in high-performance wireless sensor networks for life safety applications, proudly announce that the OPTEX iSeries Wireless Photobeam Detectors, powered by Inovonics wireless technology, have recently been awarded the 2017 SSI Security Solutions Award, in the Intrusion Detection category. The announcement was formally made at the 63rd ASIS International Annual Seminar and Exhibits taking place Sept. 23-27 in Dallas, Texas. The SSI Security Solutions Awards program distinguishes and spotlights manufacturers and vendors whose electronic security solutions have been proven in the field to meet security, safety, or other organizational needs for end users. The winning iSeries Wireless Photobeam Detectors offer a battery-powered, wireless quad beam 350ft point-to-point perimeter solution that eliminates the need for trenching or cables, and meets the copper-theft proof and damage-resistant needs of a large electric power company. An Inovonics EN1941 wireless transmitter is also pre-installed, and includes a battery expansion option for up to ten years of battery life. As an award recipient, OPTEX will be profiled in the SSI’s annual December Technology Issue, and spotlighted online and through other electronic media. For more information or to inquire about interview availability, please contact John Marco, OPTEX Marketing Manager – Security Division by email at jmarco@optexameria.com or by phone at 800-996-7839 X253. OPTEX Co., Ltd, is a global leader in indoor and outdoor security sensors, including hardwired and wireless, active and passive infrared detectors. Additionally OPTEX offers specialized sensors to trigger video systems and one-of-a-kind Class-1 laser detectors for high security and asset loss prevention applications. Founded in 1979 and headquartered in Otsu, Japan, with sales and marketing subsidiaries worldwide, OPTEX is also recognized as a sensing solutions trusted for access control, environmental monitoring, industrial quality control and safety. For more information on OPTEX, visit www.optexamerica.com.